Four of Affalterbach’s finest creations made their world debuts at the LA Auto Show this week. It was an exciting week at the Los Angeles Auto Show 2013 for Mercedes-AMG. They brought four of their latest and best vehicles to the U.S. show to excite performance fans. They delivered in a big way with the quicksilver AMG Vision Gran Turismo, the gold standard S65 AMG, the hard charging Concept GLA45 AMG and the fast departing SLS AMG Final Edition. Mercedes-AMG is the performance tuner for Mercedes-Benz and they just keep getting better every year in delivering the finest performance vehicles on the planet. LA was the place to be this week as the German tuner brought some exciting stuff to make their global debuts. Here is a brief rundown of the four AMG performance vehicles. Mercedes-AMG didn’t hold back when creating the all-new 2015 Concept GLA45 AMG. It’s an all-wheel drive rocket with a hand-built turbocharged four-cylinder cranking out 355-hp and 332 lb-ft of torque. It will deliver sub-five second 0-60 sprint times and has all the sound and fury AMG is famous for. This premium compact performance SUV will be a production vehicle in 2014. The future of AMG and performance vehicles around the globe can be seen in the Mercedes-Benz AMG Vision Gran Turismo. And it’s an exciting future indeed. The Mercedes-Benz AMG Vision Gran Turismo was created especially for the new racing game Gran Turismo 6. But AMG also created it as an example of how they will likely design their future supercars. See it in the video below and drive it on Sony PlayStation on December 6. Last but certainly not least, the all-new 2015 S65 AMG is the ultimate performance luxury sedan. It combines the full suite of S-Class safety, luxury and telematics with a hand-crafted 6.0-liter biturbo V-12 producing 621-hp and 738 lb-ft of torque. The S65 has an incredible sprint time from 0-60 mph in 4.2 seconds and on to a top speed of 155 mph. If you see the lights flashing behind you, you better pull over and let it go by. 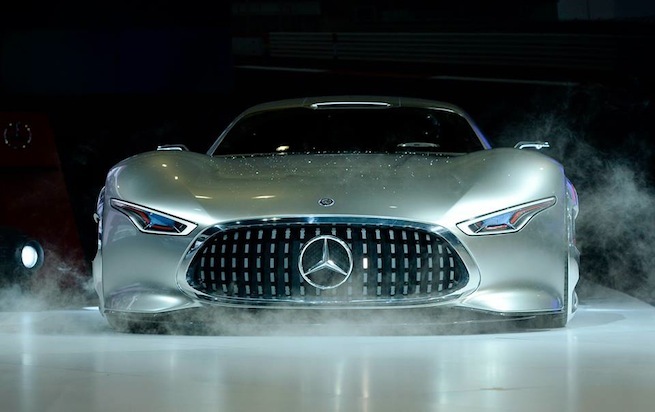 Watch Mercedes-AMG Vision Gran Turismo video.